On Saturday strong southwesterly winds associated with Red Flag Warning weather conditions tested containment lines and pushed the fire’s size to 123,649 acres by 11:30 PM. The lines held and firefighters successfully halted the fire’s northward progress at a fuel break by Brownes Lake, which is south of Sterling and the Funny River Road. 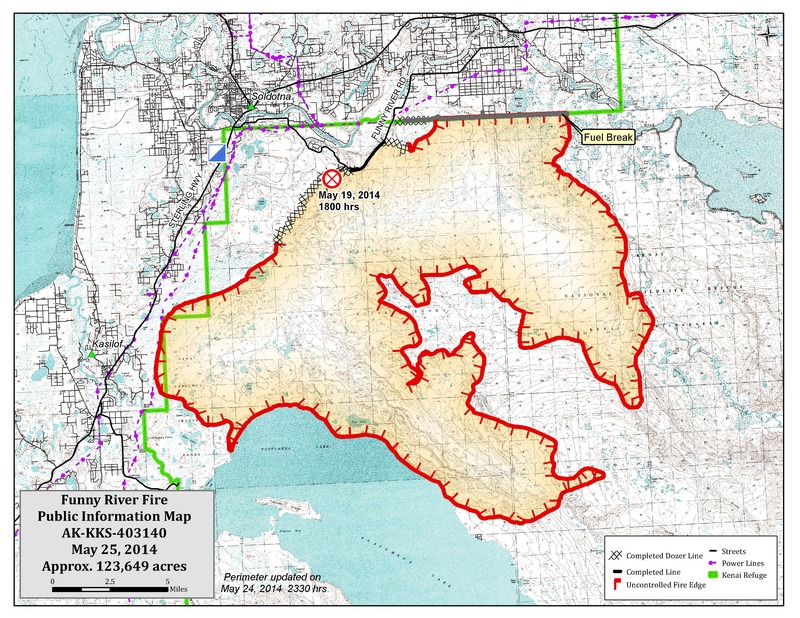 Firefighters will continue building and securing fire lines along the fire’s northern edge. Two Air National Guard Black Hawk helicopters arrived and are assisting firefighters with water drops. On the fire’s western edge near Kasilof, firefighters kept the fire from crossing the Intertie powerline that parallels the Sterling Highway. Crews will continue working on extending containment lines on the fire’s west side. Structure protection crews with fire engines are active in areas potentially affected by the fire. No structures have been lost and the fire has not crossed the Kasilof River. A successful burnout operation took place to protect the remote Bear Creek Subdivision on the shore of Tustumena Lake. Two other burnout operations took place on Saturday and successfully held the fire. 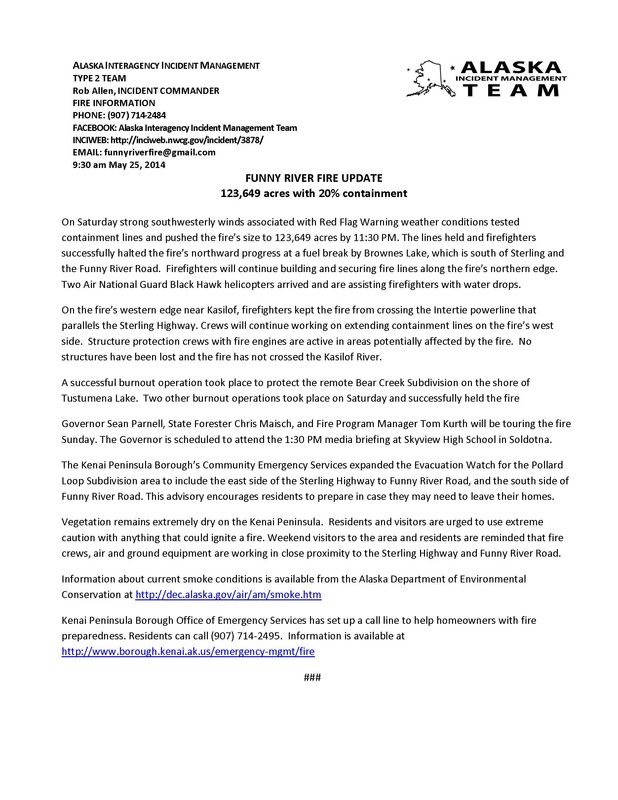 Governor Sean Parnell, State Forester Chris Maisch, and Fire Program Manager Tom Kurth will be touring the fire Sunday. The Governor is scheduled to attend the 1:30 PM media briefing at Skyview High School in Soldotna. 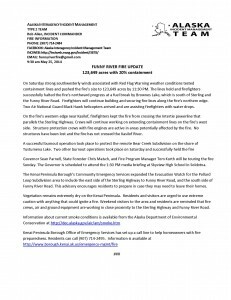 The Kenai Peninsula Borough’s Community Emergency Services expanded the Evacuation Watch for the Pollard Loop Subdivision area to include the east side of the Sterling Highway to Funny River Road, and the south side of Funny River Road. This advisory encourages residents to prepare in case they may need to leave their homes. Vegetation remains extremely dry on the Kenai Peninsula. Residents and visitors are urged to use extreme caution with anything that could ignite a fire. Weekend visitors to the area and residents are reminded that fire crews, air and ground equipment are working in close proximity to the Sterling Highway and Funny River Road. This entry was posted on May 25, 2014 at 10:32 am. You can follow any responses to this entry through the RSS 2.0 feed. You can skip to the end and leave a response. Pinging is currently not allowed.